An important benefit of incorporating a business or organizing it as a limited liability company (“LLC”) is to obtain liability protection. Historically, in exchange for the liability protection provided to owners of a corporation or LLC, certain “corporate formalities” had to be followed. As such, business owners were strongly encouraged to hold annual meetings or adopt written actions in lieu of a meeting to reduce the risk that creditors or claimants could “pierce the corporate veil” based on the absence of these records. Even though liability protection was often the driving factor in the creation and preservation of meeting minutes and written actions, these documents also constituted a permanent, tangible record of the major decisions made by the owners and/or directors of the business and satisfied various tax requirements. Changes in the law have reduced reliance on corporate formalities to preserve liability protection, and, as a result, many businesses hold owner and board meetings and adopt written actions less frequently. Nevertheless, documents such as minutes and records of action remain important and useful for reasons other than liability protection, and their creation is necessary or strongly advisable in many circumstances. For accrual-basis taxpayers that authorize the payment of a bonus but delay actual payment for the bonus until the following year, the bonus must be earned, determined, and authorized by its board in order for the bonus expense to be deductible in the current year. Accordingly, the minutes of a board meeting or written action in lieu of a board meeting can be used to substantiate the deduction. Generally, the adoption of retirement plans or amendments to existing plans should be accomplished before year-end. In addition, if a contribution is to be made to a qualified retirement plan after the end of the current year, a board resolution establishing the amount of the contribution (or how the contribution will be determined) must be adopted before the end of the current year for the contribution to be accrued and deducted in the current year. Accrual-basis C-corporations are entitled to a charitable contribution deduction in the year the contribution is made or in which it is properly accrued. If the contribution is not made before year-end, a board resolution must authorize the contribution to substantiate the deduction. Under Minnesota law, the board of directors can make a distribution only if the business will be able to pay its debts in the ordinary course of business after making the distribution. Meeting minutes or a written action should be used to memorialize any distributions. Written records of the board’s deliberation and decision can detail the factors the board considered when making the determination to make a distribution, and may be used to support the decision if later challenged. 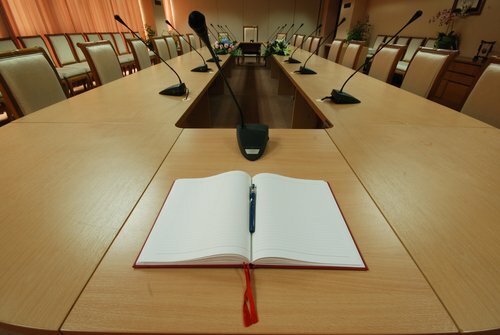 Minutes documenting the election, appointment, or reappointment of board members and officers can be used to establish the term for which the directors or officers will serve. Minutes should be adopted at the end of each year to specify the amount of compensation to be paid in the following year to business owners who are employed by their company. Ratification of Related Party Transactions Such as Related Party Loans, Leases, Etc. Meeting minutes and written records of action can provide supporting evidence if tax deductions are contested. For example, when a company loans funds to an owner, there is a risk that the loan may be turned into a distribution. Although the nature of the transaction should be characterized in the transaction documents (e.g., loan agreement, promissory note, security agreement), it is helpful if meeting minutes or a written action recite the proposed use for the loaned funds and a summary of the loan or lease terms. Many buy-sell agreements require owners or directors to establish the value of their company annually. Including the annual value of the company made pursuant to the agreement in meeting minutes or a record of action can help avoid conflict or uncertainty upon the death of an owner or other buy-sell event. Moreover, a periodic review of the company’s value can better ensure that the company has sufficient life insurance or other resources to purchase the ownership interest of an owner should it become obligated to do so. Under Minnesota law, various transactions require board approval and, in some cases, approval by the owners. Those approvals are typically documented when the transaction occurs, but any approvals not obtained at that time can be addressed at year end by a ratifying action taken during the year. Be aware, however, that because the legal and practical considerations that apply to publicly traded companies materially differ from those applicable to privately held companies, records requirements for publicly held companies are beyond the scope of this article. Cognizant that time and money are limited, we encourage business owners to call or meet with their attorney to conduct an annual business “checkup.” In our experience, a relatively small investment of time and expense can result in significant benefits when minutes or other documents are available to prevent ambiguities or misunderstandings, substantiate accruals for tax deductions, and serve various other purposes. Accordingly, we encourage all business owners to make time for minutes.